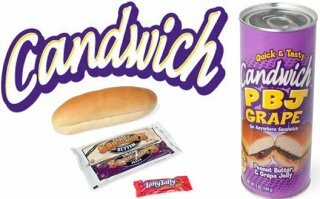 Candwich, the sandwich that comes in a can. Yes, I’m not making this it, it really is a thing. Marketed as a product for people on the go, the Candwich is now available for sale and will come in various flavors although currently only the peanut butter and grape jelly variety is available (BBQ Chicken and peanut butter and strawberry jelly are coming soon). Each 4-pack of sandwich in a can will set you back for around $12 or $72 for a 24-pack.